Recently we have heard customers express disappointment with their recently purchased leather furniture. Their furniture was 2 to 6 years old, and the leather was wearing out in a variety of ways. This similar experience was reported in various consumer dissatisfaction forums. There are two types of leather suited for furniture, Full Grain and Top Grain. Full Grain is the very top portion of the hide, the best quality for strength and wear. Top Grain is the portion of leather under Full Grain. Top Grain is used many automobiles and is typical leather on older furniture of our parents and grand parents. 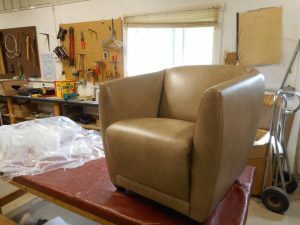 The other types of “leather”, “leather like”, “reconstituted or recycled leather” have significantly lower costs to produce, thus found on attractively priced furniture. When shopping for furniture, if the label does not specifically say Full Grain or Top Grain, then the durability is suspect.